That’s my favorite number. I’m not exactly sure how it came about but I remember when my husband and I were talking about getting married, I knew I wanted August 22nd. My dad’s birthday is on the 22nd; my grandpa’s birthday was the 22nd; my grandma’s birthday was the 22nd. Whenever I see a 22, I get this amazing feeling come over me as if God is showing me just a little bit of His presence. When I am worried about something and praying, so often I see a 22 – on a sign, on a license plate, on the back of a semi truck, etc. I always try to do something special for myself on the 22nd of each month like get a massage, buy myself some flowers, go to my favorite restaurant, eat my favorite dessert or watch my favorite movie. But a few weeks ago, my friends surprised me on the 22nd. I was planning to have dinner with my friend, Lisa, to help her break up her busy season as an accountant. She chose the 22nd because she knew it was my favorite number. When I went to meet her for dinner, she had planned a small week-early birthday surprise dinner with a few other of my very close friends. There was a huge bouquet of balloons dancing in the air, gifts at every corner of the table, excited smiles as I rounded the corner and there – sitting in the middle of the table – was the most beautiful bouquet of flowers. A bouquet filled with carnations, daisies and these other flowers that last forever that I love but don’t know the name 🙂 , sitting in the cutest little fence-post container. What a wonderful surprise it was for me that day. 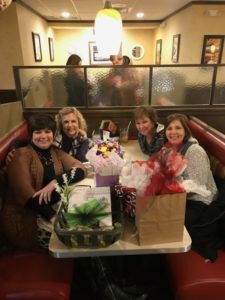 Just a few friends gathering together at a local restaurant but the best gift was the effort it took to gather busy schedules, pick up balloons in the snowy, windy weather, order the perfect bouquet of flowers and spend a couple hours away from the hustle and bustle of phones and everyday life. It made my day! As we continue Random Acts of Kindness week, our challenge today is to find a way to make someone else feel special. Order flowers to be delivered. Pay a compliment. Take time to have lunch with no distractions. Pick up a cupcake and deliver to their desk at work. Whatever comes to mind for you to do to brighten the corner of someone else’s world, do it! We really can make a difference, one act of kindness at a time. This entry was posted on February 12, 2019 with tags: #makeadifferenceeveryday, #rakweek2019 by Deanna Young.